Our unrivalled reach is great news for advertisers and commercial partners. If your business wants to reach as many people as possible then we have a range of display options that will do just that, from classic high-impact positions to dominant page takeovers and clickable eWraps. You can rely on our digital display solutions to put your message in front of prospective customers, driving response and maximising return on investment. Whilst a digital display advertising campaign is the perfect way to reach a wide online audience, we also offer tailored solutions to help you connect with the right people, in the right areas, at the right times. If you wish to reach specific groups based on their demographics, lifestyle, location and other details then we have a suite of powerful targeting tools that will achieve your aims with ruthless effectiveness. We have a deep, demonstrable understanding of our audience and we can use this insight to tailor campaigns to your exact requirements. And with our Cross Network opportunities you can reach your target customers wherever they are: locally, regionally or nationally. A highly-effective ad spot at the top of the page just below the main navigation bar. These spots are larger than the traditional banner/leaderboard and offered increased impact. They can contain flat imagery or rich media to deliver eye-catching results. 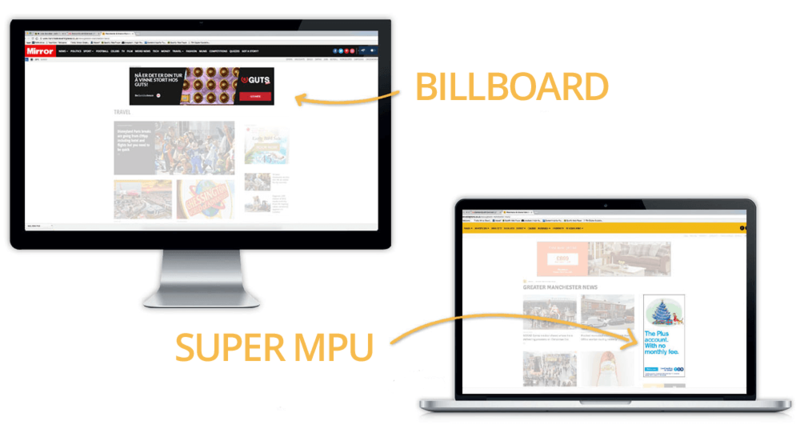 The everyday square MPU (Mid-Position Unit) is fine, but if you want to double the impact of your campaign then a Super MPU is the way to go. These are located on our article pages and can display flat imagery or rich media. As the name suggests, the Mobile MPU is displayed on our responsive websites when viewed on tablets, phones and other mobile smart devices. It occupies a high-impact position on the mobile page. The MMA Banner is an advert on a mobile device that’s located at the bottom of the screen. The advert is ‘sticky’ and remains in position even when the user scrolls the page, ensuring maximum screen-time and exposure. If you’re looking for page dominance then only a Site Skin will do. We take your creative content and use it to replace the entire background of the page. 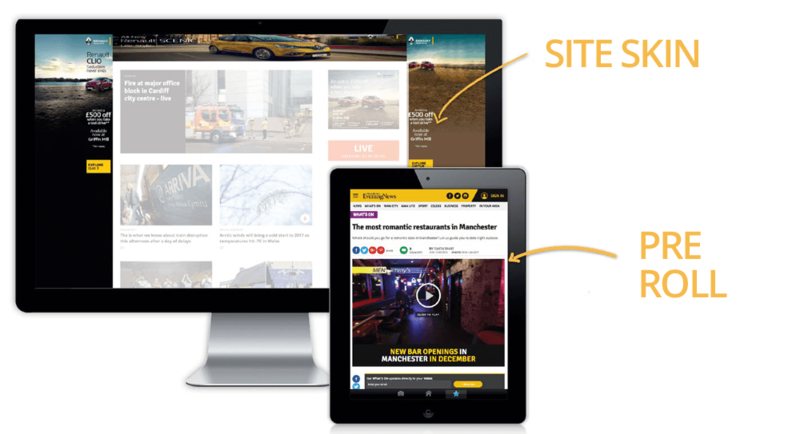 This delivers the complete rich media experience and is the most visible, impactful and effective option available from our online advertising suite. A Pre Roll advert is a promotional video that is played across desktop and mobile before the specific editorial content that the viewer chooses to watch. If you would like such a video for your business we can create one for you.